I’ve known the band, South to Cedars since I booked them to play a showcase a couple of years ago. I was immediately taken with their upbeat performance and their musicianship. They bring a lot of light to the stage, and their songs are finely crafted and well played. The band first formed as a more Americana focused subgroup of the traditional bluegrass group Jerusalem Road. 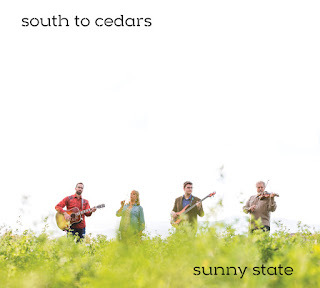 Their debut album Sunny State has plenty of bluegrass flavor, but there’s a lot more here to find than just that. There are some genre bending journeys to take on this record, from an almost pop sensibility, to modal country, to Latin and beyond. All the songs on the album are written by guitarist/mandolinist/vocalist Ben Haugestuen, who has an ear not only for strong melodies and interesting chord progressions, but he also demonstrates the ear of an arranger. This is particularly apparent on songs like Daydreaming, Stupid, Rivers Red, and the album’s title track. His playing is complemented beautifully by Greg Fischer’s tasteful and melodic fiddle parts, and solid and creative bass lines coming from Jim Eads, who also lends his voice in harmony. Haugestuen shares lead vocal responsibilities with vocalist and percussionist Shawna Stratton. The two of them blend in a way you would expect from two excellent singers who have been playing together for years. The harmonies are tight, and the brightness of her voice has a sweet balance with the darker high baritone sound of her counterpart. I’m also impressed by the quality of Haugestuen’s lyric writing. He’s comfortable with both directness and subtlety, and both qualities show up in his writing again and again. On an emotional level I find the album uplifting and spirited. Even the ballads have a way of coming around to a welcome sense of redemption and optimism. This is a perfect record if you want to just let go and feel better. I suspect that listening while driving might increase the possibility of speeding tickets. The production and engineering skills of Darren Radach support the band beautifully. The album was recorded start to finish at Radach’s Stout Studios in Fort Collins. He also lent some additional percussion to the album. The mix is clear and pure, and you can hear every word and note. Altogether, I think most people will find something to love on this album. I can also say that South to Cedars is a wonderful live band. Every time I’ve seen them I’ve left the venue at the end of the night feeling energized and dare I say happy. Sunny State is true to that live experience.